You awaken in a cell, Check the window behind you. Open your bag. Drop the Medal on the Plate below your cell. Continue to Drop the medal on the plate. Feed the bread to Tentacle in the grate. Pick up the Corner Stone from the Basket and Place in hole below. Align each Corner Stone until they Click. Touch the basket and Click the bottom of Casket (get cloak). Use the cloak to hide from the guards on the stairs, twice. Click on the spider to turn off the light. Duck under or jump over the thrown guards. When the big guard stamps his feet, click on the spider. Pick up the guards spike. Click on the wooden handle stuck below. Pick up wooden handle pieces. Click on the dead Guard. Use the wooden handles to climb the wall. Pick up another two wooden handle pieces. Place the wooden handles on the lift pulley to fix the wheel. Pull the lever to drop the bag on the guard. Run behind the pulley to hide from the guard. When the looks to the right, move to the gap in the wall. When the guard looks to the left, move to the gap in the wall. Time your moves across the Castle wall to avoid the light and the flying imp. You now have access to ten areas of the castle from the courtyard. Once you enter each area the name of that area will be displayed when you hover over it from the courtyard. Collect the Pepper Shaker and Feather in the Pantry. Use the Feather on the passed out guard in the Pantry. Pick up the Mug and Boots in the Pantry. Pull down the sheet in the Pantry. In the Camp Area, Move the training dummies to help the small Guard win. In the Camp Area, Jump through the gap onto the fan below. Twice. In the Camp Area. Pick up the Gloves in front of the tent, use gloves on the helmet in the fire. Click on the Cloak, twice. In the Camp Area, Click on the Stump next to the Breastplate, Pick up the Breastplate. Read the books on the shelf to the right. Get the red leaf. Make note of the Triangle symbols in the red book. Use the Triangle symbols to open the Chest on the left side of the room (turn the second and last triangle upside down and then put the little bars on them). Use the wand on the mirrior, turning clockwise to turn on, control the volume with the wand. flick through the channels and turn the volume right up. Look at the Desk, Take note of the piece of paper with the lines connected to dots, this is the solution to the glowing orb on the right side of the room. Click on the Glowing orb and connect the stars as shown on the piece of paper (starting from left top to create an upside down "M" shape). In the Armoury, Place the duck sheild on the large sheild. (Click the sheilds in the order: Bear, Zebra,Dog, Duck, Cat). Climb the rope and use the mug on the Golden water. Go back to the Courtyard. In the Great Hall, give the teddy bear his eye and use the Mace to smash the Chain on the door. Go through the doors, walk past the sleeping dragon, to the kitchen on the left. Get the Sieve from the Utensil Rack. Go back to the room with the Dragon and click on the Powerpoint on the wall. The dragon will eat you. Click on the mace below you. Grab the bubble maker from the skeleton hand and pour some in the green pond. Quickly stick the mace in the gap. Follow the Green Blob and use the Sieve on it to get the pink cup. Go back to the Kitchen, get the purple cup from the cupboard below the kettle. Place each cup on its matching plate, turn the tap on and fill the kettle. Turn the knobs below the stove to boil the kettle, pour the boiling water in the teapot and pour the tea into the cups. Give the Green tea cup to the Troll, the Pink tea cup to the Princess and the Purple tea cup to the Unicorn. Pick up the Explosive pebbles from behind the troll, Grab the Soda bottle from the fridge. Go back to the Green Blob and use the Soda and then the Explosive pebbles on it. Click on the door and pull the chain. Use the Mirrior on the Wizard and then Run away. 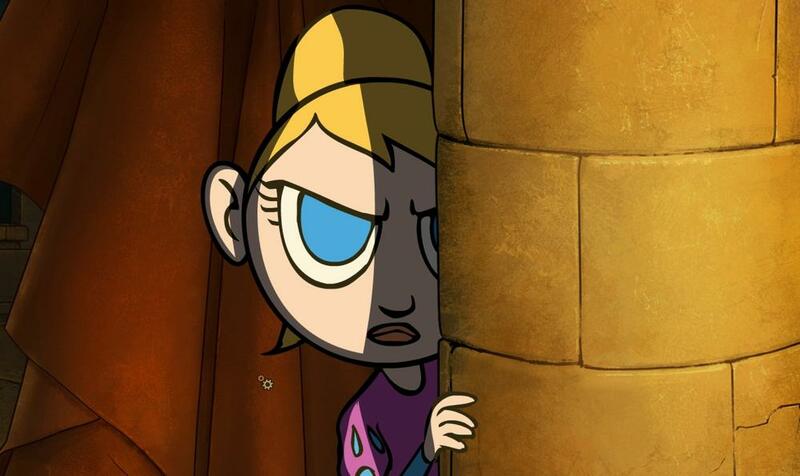 Each time Tsioque falls, click on her.